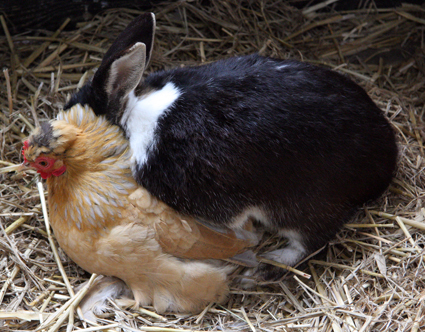 A bad witch's blog: The Real Story of the Easter Bunny and the Chicken? The Real Story of the Easter Bunny and the Chicken? I saw this delightful pair getting energetically amorous at a farm zoo much frequented by families with kids. And there were plenty of parents going red in the face when their little ones asked, "What's that rabbit doing to that chicken, Daddy?" One theory about the origins of the festival of Easter is that the word derives from Ostara or Eostre, which according to the Venerable Bede in the 8th Century is the name of the Anglo-Saxon goddess of springtime. Although current academic opinion is that Bede might have been less than factually accurate in his writings, many modern pagans celebrate the Feast of Eostre at the time of the Spring Equinox, which is on March 20 in 2013. There is a well-known folk tale that the Goddess Eostre once found a wounded bird in the snow during the winter months. In order to help the creature survive the cold weather she transformed it into a hare. In the spring the hare laid a clutch of eggs, showing that it was still a bird at heart. This is one of the origin myths that connect the Easter Bunny and Easter eggs. Although hares and rabbits belong to different species, they look very much alike and people often get confused. I think the rabbit in the photo is probably even more confused when it comes to species identification! Indeed, folklore can be old or new. Modern folklore includes the Jack in the Green, which dates back to Victorian times. More recent folklore includes many modern urban legends. Just because something is folklore, doesn't mean it is old.